Fancy letting the children’s decorate you a delicious box of cupcakes for Mothers Day? Fancy night off from making their tea? 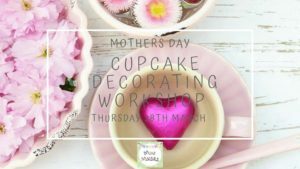 At my workshop the children will be learning to roll fondant, swirl buttercream and use a variety of cutters to make you a box of yummy cupcakes. Followed by Afternoon tea for all the children with lots of yummy treats and juice for the children to enjoy! £5 deposit required on booking with balance due by 14th March.